If you're considering buying the As-Seen-on-TV product, the Potty Patch, to help save your home or apartment from frequent puppy accidents, taking the time to read a number of Potty Patch reviews will give you an idea of what to expect from this product. What Is the Potty Patch? The Potty Patch is a three-tiered indoor doggie restroom that mimics the look and feel of real grass, thereby attracting dogs that are trained to go outside. The concept behind the Potty Patch is that a dog will be more likely to use the Potty Patch than eliminate on carpeting or bare floors. 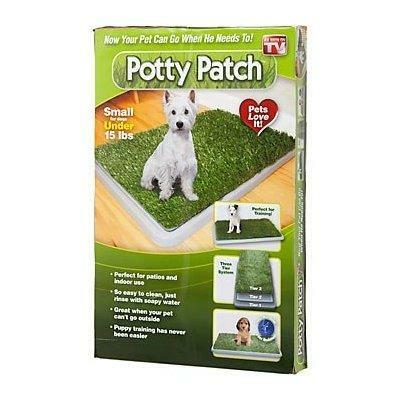 The Potty Patch is supported and presented by the American Kennel Club (AKC). The Potty Patch has three tiers; there's a top tier, a middle tier and a bottom tier. Each tier is constructed to perform a specific role.The top tier is a covering of artificial grass that's designed to look and feel like real, soft grass. The grass mat allows liquid waste to flow through it and into the bottom tier. The middle tier is a grate that is used to keep the liquid waste in the bottom tier away from the top tier. This allows the grassy area to remain dry at all times. The bottom tier is the collection tray where the liquid waste is stored until it is emptied and clean. The collection tray is capable of holding up to a gallon of liquid which makes it convenient for multiple uses if necessary. The Potty Patch comes available in two different sizes, a regular size (17 inches by 27 inches) and a large size (27 inches by 34 inches). The regular size is priced at $39.99 plus shipping and handling. The large size if $79.99 plus shipping and handling. The makers of the Potty Patch also offer a free upgrade to their super-plush, anti-microbial grass mats that have double the blades of their regular mats. According to the official website, this is a $60.00 value that comes free with your first order. Replacement grass mats cost $24.95 for the regular Potty Patch and $39.95 for the large version. Potty Patch Reviews - Is It Worth It? It's common for people to be skeptical about products that are sold exclusively through television infomercials or online, so it's always important to do your research before making a purchase from these sources. Here are a few Potty Patch reviews that will help you determine if this is a product you might want to try. JennyReviews.com reviewed the Potty Patch and found the product to be a welcome addition to their dog's bathroom habits. According to the reviewer, "If your dog spends most of their time indoors, you will want to make sure you try the Potty Patch." JennyReviews.com rated the Potty Patch a solid five out of five stars. The product review site ConsumerSearch.com wasn't as pleased with their analysis of the Potty Patch. According to many of the dog owners polled, the grass slid around a little too freely and made a loud noise when the dogs walked on it and thereby would often spook the dogs from using the product. In addition, they report that if the dog does happen to use the product, the tray is odorous and difficult to clean. HonestInfomercialReviews.com offers up pros and cons from both sides of the fence. Whereas some reviewers love the Potty Patch and highly recommend the product, many others claim that you have to clean it thoroughly every day and that it can start smelling terrible in as little as two days. Many reviewers state that while not perfect, it is a useful way to begin housebreaking a puppy. On her blog, BlogCritics.org, Miss Bob Etier tried the Potty Patch out with her own dog and found that the dog had absolutely no interest in using it. She claims it is not practical for adult dogs, but that she probably would recommend it for someone who is trying to housebreak a puppy since it is a better solution that using newspaper. As you can see, Potty Patch reviews are just as varied as most other As-Seen-on-TV products. However, one opinion that they all seem to have in common is that it is effective as a housebreaking tool for puppies. Therefore, it would appear that if you have an older dog, you may want to avoid spending $40.00 to $80.00 for a product that older dogs seem to have a tough time getting used to. If your pet is a pup, teaching him how to use it early on may provide you with some peace of mind whenever you're away from home for more than a few hours. The Potty Patch can be purchased by ordering from its official website, by calling 1-866-518-2294 or through various online shopping sites like Amazon.com. This product is not available in stores at this time.